In 1943, Thomas Watson, president of International Business Machines (IBM) said, “I think there is a world market for maybe five computers." At the time, a single computer was the size of a large room. Today, we have millions of small computers — from laptops to tablets to iPhones — and we carry them with us in our backpacks and pockets. Our world continues to prove Watson wrong. In the same way the personal computer revolution transformed how we engage with electronics, the water industry is decentralizing and democratizing. Industrial end users are looking to efficiently treat water at the point of use, a strategy that lowers overall treatment costs and results in smaller environmental footprints of these treatment facilities. According to Lux Research Inc., 90 percent of the U.S. population relies on “mega-facilities” to treat their wastewater. These gargantuan facilities are expensive to build and operate. They move water to and from remote locations requiring long pipelines that are inevitably susceptible to breaks and leaks. Oftentimes, the condition of these systems is poor and the pipes are aging. This leads to the discharge of an estimated 900 billion gallons of untreated sewage annually. Despite new pipes being added to expand service areas, centralized wastewater treatment systems expected to serve large swaths of populations are degrading faster than they’re being restored. With the global population expected to exceed 9 billion by 2050, the financial, environmental, and social costs are projected to rise significantly unless we pay immediate attention to our infrastructure and wastewater management practices. According to the U.S. EPA, updating our national wastewater infrastructure will require an investment of $271 billion. That number includes investments in new pipes and money needed to modernize the treatment technology and to implement new methods for stormwater mitigation. If we continue to try and repair the centralized system that is clearly broken, by 2040 the funding gap will reach $152 billion. Instead of rebuilding our current infrastructure, we can equip water users to treat their own water with small, modular water treatment systems that can be built and installed locally. The opportunity is clear: move to a decentralized structure. So what does a decentralized model look like? 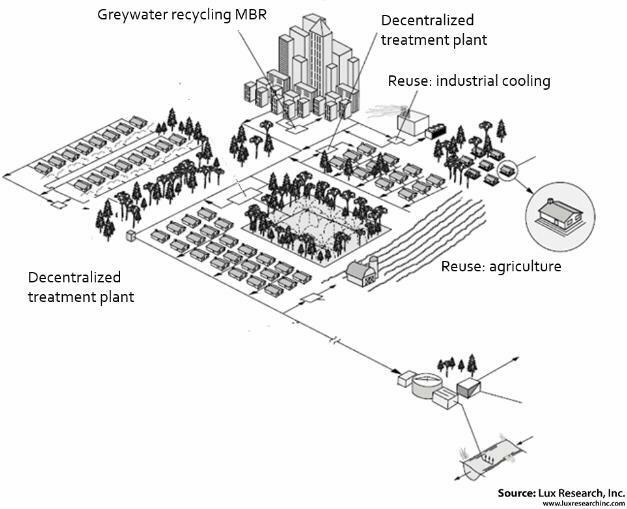 According to Lux Research, “It is the collection, treatment, and disposal or reuse of wastewater from individual homes, clusters of homes, isolated communities, or institutional facilities, as well as from existing communities, at or near the point of waste generation.” The below image depicts what a decentralized model would look like if it were driven by water scarcity and high reuse. In it, the treatment plant is treating wastewater from smaller facilities at a closer proximity to those facilities. Download the Lux Research webinar, "Closing the Loop: The Future of Decentralized Water"
Decentralized wastewater treatment relies on shorter pipelines which are not highly pressurized and, therefore, less prone to breakages or leaks. In fact, reducing pressure decreases leakage by about 30 percent. Because of this, decentralized facilities are less expensive to maintain. The decentralized treatment strategy is most popular in developing nations where decentralized facilities serve remote communities where it would be too expensive to connect to a centralized plant. But it’s catching on quickly in the U.S. — particularly as steadily increasing water costs are forcing companies to reuse as much water as possible. However, there are challenges to implementing a decentralized treatment strategy. Water reuse poses a serious engineering challenge: how to restore clarity quickly to fouled waters, enabling efficient final-stage polishing. Additionally, businesses often lack the people, money, and know-how to do so. Los Angeles-based OriginClear recognizes this two-fold problem. To address the first problem, the company developed an on-site, electrochemical wastewater cleanup technology that does the “heavy lifting” or clarifying of high-turbidity waters. The platform employs a combination of next-generation electrocoagulation, electroflotation, and electro-oxidation processes across multiple stages to complete high-speed water treatment, with minimal consumables and low energy use. A year ago, OriginClear began addressing the second problem for businesses by forming the OriginClear Group™ to acquire companies with complementary services to offer a complete array of solutions through one provider to any customer anywhere. The combination of highly competent service companies and a breakthrough technology enables us to take advantage of the end opportunity: specialty water treatment and movement to the decentralized model. Innovation is the critical piece in all this — innovative technologies and services to help businesses use their water resources responsibly and economically.